I thoroughly enjoyed reading this series - interesting stories with surprising twists. Fantasy is not my normal reading genre but I look forward to more from this talented author. This is a well written third (and final?) installment in an intriguing series. The writing quality has definitely improved since the first book as the author has come into his craft. The characters are more layered and easier to connect with and even tug at your emotions. The plot threads are brought together nicely with a clean smooth ending that should please many readers. Overall this is an enjoyable read and well worth the purchase. I received an evaluation copy through the author in exchang This is a well written third (and final?) installment in an intriguing series. The writing quality has definitely improved since the first book as the author has come into his craft. The characters are more layered and easier to connect with and even tug at your emotions. The plot threads are brought together nicely with a clean smooth ending that should please many readers. Overall this is an enjoyable read and well worth the purchase. I received an evaluation copy through the author in exchange for an honest review. This in no way influenced my opinion. This book was gifted to me by the author as an exchange for an honest review - As the thrilling conclusion in an excellent series, Hunters of Reloria, I have to say I loved and enjoyed the complete three-book series. The fierce battles are so clearly described, the characters you fall in love with as they continue to evolve. There were some sad points, so be prepared with a tissue. This book continues with more dramatic adventure through a portal and back again, and new allies… the dwarves, elves, wizards, dragons, fairies, and halflings…some die and some are born again. Very well-written, a must-read that keeps you on the edge of your seat. I highly recommend. All the books were excellent and this one is my very favorite. 5 Stars all around. Well done Kasper for creating a world that all ages can get lost in and find that child like adventure of old. Dragon's Revenge is the final in the trilogy The Hunters of Reloria. I received this copy in exchange for an honest review as part of the release tour for this book, having previously buying book 2 myself. The weary band of heroes are valiant in their quest, despite their losses, they do as true heroes do, battle on despite Their pain and suffering knowing that the quest is more important than their individual pain. The world building continues to grow, Kasper Beaumont leads us onto the twin plan Dragon's Revenge is the final in the trilogy The Hunters of Reloria. I received this copy in exchange for an honest review as part of the release tour for this book, having previously buying book 2 myself. The world building continues to grow, Kasper Beaumont leads us onto the twin planet in this book and we meet the foe on their home turf, The imagination is brought to life with both the descriptive writing of the author and also the sketchings and paintings that have been included in this final edition. One of my favourite places that we get to visit was the world of the wizards, talk about a crazy unpredictable place. This book is just full of places that will get any fantasy lovers imagination engaged. I was happy with the outcome of this final book, but there is scope for more adventures I am sure, and if these characters start demanding for more I am sure that Kasper will let them out and once again let the creative juices run riot. As I have said before this series is suitable for readers 12 and upwards, and probably younger if the reader has got a good vocabulary base. This series will engage young reader and let their imaginations run wild as all good book should. 5 stars A wonderful end to an amazing journey! Book three finishes where book two leaves off; Ash , Sienna and Daeron have gone through the portal that leads to where the Vergai live to save the Elevn princess, Shari Rose and are now trapped there. Daeron has been captured by the evil cylops who run the land and rule over the vergai and it is now left to Ash and Sienna to save him and the princess. Meanwhile the rest of the ‘Hunters’ have been helping their newest recruit ‘Violetta’ to take her mage trials to become a fully fledged mage. The vergai are getting closer and closer all the time and Reloria have suffered many losses of different races. The Hunters and their new found friends are now ready to make one last stand against the invaders and they hope to save their land and people. Will Ash, Daeron, Sienna and Shari Rose going to make it back in time.? There are some unusual romantic pairings in this book but it works out really well and it is nice that the characters even though are on the way to war still have time to find love. The last battle is intense, sad and full of action with severe losses on both sides. If you loved the first two then you will love this book. The ending is well thought out and ties everything up nicely. 5.0 out of 5 stars Captivating imagination! One of the most creative books I've read lately. I'm not sure what it is with Aussie authors, but their imagery and brilliant imagination captivates my interest! Dragon's Revenge is the conclusion to the Hunters of Reloria series, and a fitting one, too. The heroes go to hell and back (okay, through a portal to another planet, in fact), face insurmountable odds and fight legions of evil-doers. This much, I expected. What I did not expect was the extent of Beaumont's imagination and creativity and her descriptive abilities, that painted vividly not one, but a whole score of worlds, from a wizard's city unlike anything I had ever read to deep forests and faraway planets. My only question concerned the fate of a certain hero at the end. Is there a sequel or short story to follow? If so, I'm buying it. An enticing and exciting trilogy with totally new concepts and ideas. By Annagh Format:Kindle Edition|Verified Purchase These three books by Kasper Beaumont are a refreshing read for regular Sci Fi addicts. With some fabulous new concepts, a troop of dedicated albeit mismatched adventurous set out to save their world. The Hunters of Reloria trilogy are as easy to read as they are captivating, and well crafted for their target audience of young (and old) teenagers. As a Science Fantasy reader of many years, I can thoroughly recommend these books to you. Enjoy and happy reading. 5 stars. Finally, I have found an author who writes my type of happy ending!!! Dragon’s Revenge by Kasper Beaumont was the perfect ending to a wonderful trilogy. There were some sad points in the books. Let’s face it, we can’t have everything. Nevertheless, the book as a whole was extremely satisfying. The Hunters of Reloria is definitely going on the list of ‘My Favorite Series’. 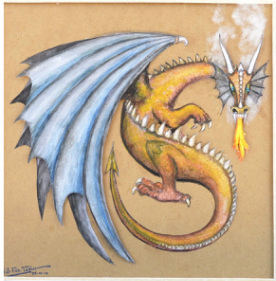 5-Stars ReviewDragon's Revenge is the conclusion of Hunters of Reloria series. I have read and reviewed the first two books and waiting for this one to be released. I loved this series and had a lot of fun reading about amazing world of Reloria. In many ways it reminded be of the "middle earth" but it also possess an originality that made it all the more fun. Reminiscent of some ways of the worlds created by Robert Jordan, George R.R. Martin, and J.R.R. Tolkien, Kaspar Beaumont artfully combines adventure, humor, and a little bit of romance with the message that any differences can be overcome if the motive is strong enough. Dragon's Revenge is a book I would recommend to any highschooler or 20-something seeking a good fantasy novel. - Perfect Editing: This is a very clean book. I didn't find any typos or grammar mistakes. Having said that, I have to withhold any more stars. I wish I could have connected more intimately with the characters. They all have potential to be deep, but they didn't touch my heart. Yes, there were great adventures, intense fights, sweet kisses, personal losses and at the end – well, that would be a spoiler. But I couldn't feel the characters' emotions while reading the tale, even though some very tragic events occurred. Which is sad, because the story itself has great power. And thus, Dragon's Revenge only gets three stars. I’m honestly not sure where to start. I took a liking to this series from the moment I finished the first book. I’m sad that it ended but also happy with the outcome. In Dragon’s Revenge, the Hunters of Reloria are still fighting the good and noble fight. Again new allies and enemies are met. Friends are won and lost as happens with battles. The strength of halflings, fairies, wizards, dwarfs, elves, dragons are tested when almost an entire race is laid to waste. 5 stars An Exciting Fantasy Chock Full of Adventures and Strange Creatures! An adventuresome and exciting fantasy that keeps you on the edge of your seat. The story is about a land called Reloria. This magical land is invaded by enemy ships carrying giants who shoot laser beams out their one eye. There are all kinds of creatures who come to aid the Relorians in their battle to protect their land. There are dwarves, elves, wizards, dragons, fairies, and halflings and more excitement as the battle ensues, lives are lost and reborn. There are two books before this one. This is a wonderful fantasy that will captivate YA. I was gifted this book in return for an honest and unbiased review. I was really eager to read the final book in the series and this did not disappoint... In fact I think the writing got better and better with each book. The characters are easy to love and the adventure fast paced and exciting and the ending is really satisfying with some delicious surprises in plot. I'm not usually surprised by a story line but this author managed it so I'll definitely be looking forward to more books from this author! You get the feeling that you are there with them, sword in hand helping to combat the enemy. The Dragon's revenge completes the adventures of the small band of unusual allies known as, The Hunters of Reloria. As their characters grow in depth and roundness they are thrust into fast paced and exciting, though deadly situations. They must learn about deep friendship, trust and teamwork to survive. The battle scenes are expertly described; there are plot twists and challenges around every corner. The imagination of the Author again reaches to new heights; with mind blowing new characters and wacky scenes. Humour and witty retorts between the main characters are perfectly timed, with an original and authentic plot. The writing style is informal with a gentle simplicity that adds loads of emotional quality to the novel. The ending will have you riveted as the Hunters are joined by all Relorian inhabitants to defend their home and freedom. A superb effort and fabulous trilogy. Thank you for allowing me to share in your adventure.